I have to say that I wasn’t quite sure how I felt about this next illusion when I first saw it. At first, I actually thought it was real. Once you see the image, you’ll understand why I was a little disturbed. Can you imagine driving behind this truck? What would you think? So, this optical illusion is clearly nothing more than a decal, but what’s the story behind this one? Apparently, this optical illusion was created for advertising purposes. Hornet Signs, a Texas vinyl graphics company, created this realistic decal. A company employee volunteered to model for a photograph, and the photograph was used to create the decal. It turned out so well that some local residents actually called the police to report a kidnapping. The whole purpose of this kidnapping decal was to show off their skills and garner attention. The company did get lots of attention for this, but it may not have been the type of attention that they wanted. Not surprisingly, lots of people had a little something to say about a company plastering an image of a bound woman on the back of a truck. It wasn’t just local residents either. The Hornet Signs Facebook page received negative comments and backlash from people around the world about this little kidnapping optical illusion stunt. 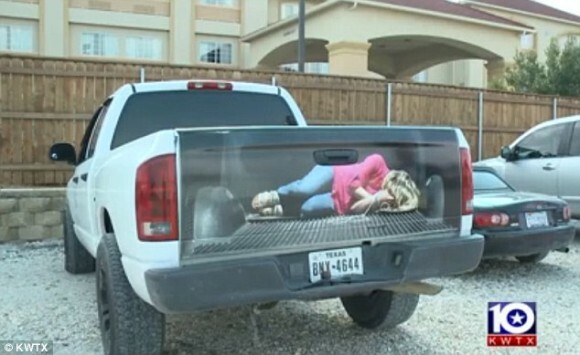 What do you think about this truck decal? Was it tasteless and insensitive, or was it brilliant? Think this illusion would be weird to see driving down the road? What’s even weirder is a car riding a skateboard! Next Is this Cat Going Up or Down the Steps? It was Texas. ’nuff said.